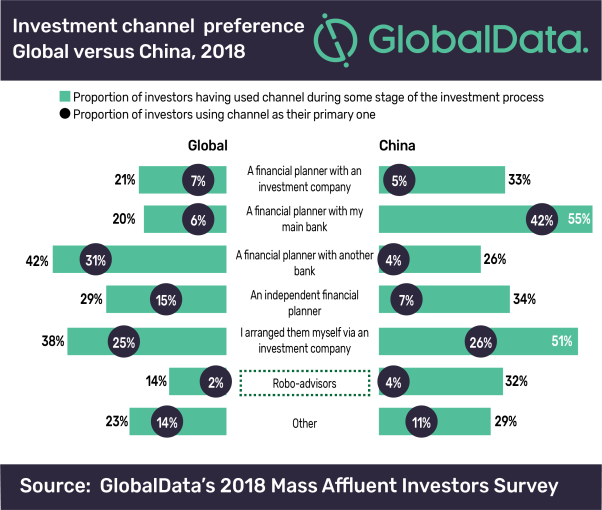 A rapidly rising middle class, strong consumer demand and a shift towards investment products outside of deposits make China an ideal playground for automated investment services (robo-advisors), says GlobalData, a leading data and analytics company. 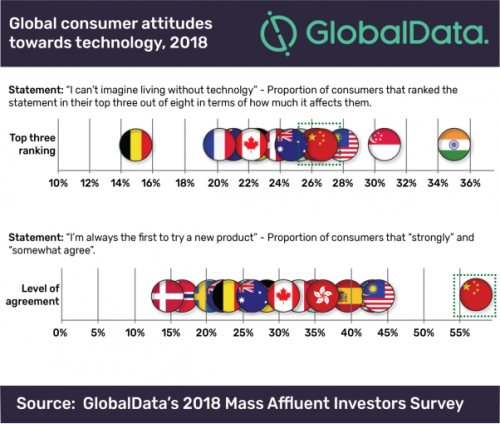 An analysis of GlobalData’s 2018 Mass Affluent Investors Survey shows that more than a quarter of the total 1,000 respondents ranked the statement ‘I can’t imagine living without technology’ within their top three, meaning only a few countries in the world place greater importance on technology. Meanwhile 57.3% of Chinese investors state that they are ‘always the first to try a new product,’ making them more open to new business models. The survey further reveals that even though only 4.2% of Chinese consumers use a robo-advisor as their primary investment provider, this is almost double the global average of 2.3%. In addition, the proportion of individuals who have at least tried a robo-advisor stands at 31.8% in China, compared to 13.7% on a global scale. The country’s big banks, including China Merchants Bank, have developed their own robo propositions. Yet China’s investment market is set to grow rapidly, meaning it is far from saturated. New entrants will face competition from China’s big tech giants such as Ant Financial and Ping An-backed Lufax, as well as start-ups like WaCai. Hoevel adds: “Going forward, growth will further be aided by a shift out of deposits and greater uptake of investment products.” According to GlobalData’s Retail Investments Analytics, Chinese consumers allocate 72% of their liquid wealth to deposits, while another 20% is allocated towards equities. The remainder is split between mutual funds and bonds. A growing middle class is another trend in favor of automated investment platforms. Millionaires and HNW investors are often the key focus in China’s wealth market, with competition in this space increasingly fierce but this is changing. Over the next four years, another 8.3 million individuals will qualify as mass affluent as per GlobalData’s Wealth Market Analytics. This equates to another $1.7tn up for grabs, which constitutes a significant opportunity for robo-advisors.